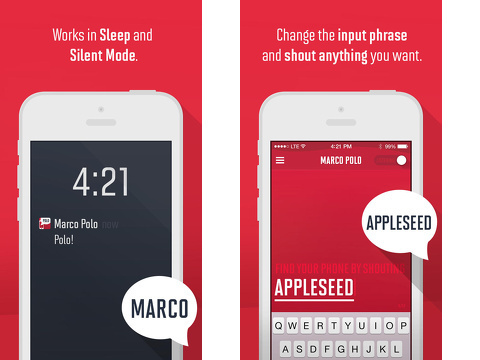 The Marco Polo iPhone App uses voice recognition to help you find your iPhone. Inspired by the game you grew up playing in the pool, you yell, “Marco,” and the phone answers, “Polo.” The $.99 download from the iTunes App Store is fun and helpful, but not always consistent in its performance. The graphics of the Marco Polo iPhone App are bright, engaging, and sophisticated. The bold red background of the icon’s color fills the screen. Shades of this bright red form the top menu bar and the instructions at the bottom of the screen. The white colors on the screen are the action items – turn on and off, settings access, and change the word you shout. To change “Marco” to a different word, you simply type a new word. The concept is simple, but patience is required to get the hang of it. I have a Southern accent, so I tend to speak slowly. Once I said “Marco” quickly, the phone responded to my call more frequently. But it still didn’t respond as often as it should. I changed the tone of my voice to a lower, more masculine pitch. After these discoveries, it works more effectively. The Marco Polo iPhone app decreases your battery, but this issue is usually resolved in future updates and progress with the technology. The concept is a welcome step forward, and it is cool to see voice recognition used to address common problems. 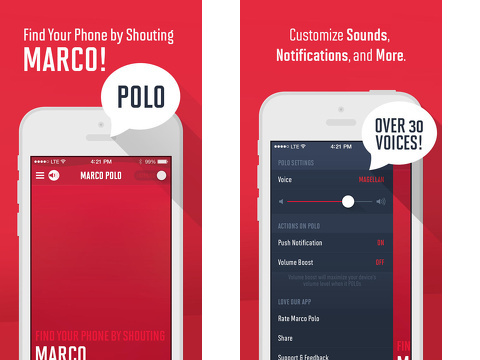 AppSafari review of Marco Polo: Find Your Phone by Shouting MARCO! was written by Jenni Ward on May 22nd, 2014 and categorized under App Store, Fun, Productivity, Utilities. Page viewed 11762 times, 2 so far today. Need help on using these apps? Please read the Help Page. I love this application is very useful in everyday life. not tested, but it looks good. The idea of this app is amazing and very very useful. This app is very very fun and useful! Yes, this app is very good. Worth it. Excellent application, really for technology has no limits. Thank you!